Business card style CD ROM have can provide an impact and because of their size can be a very practical way to share important information. Outline: The Criminal Law Solicitors Association is a professional body for solicitors and has around 1200 members. It runs an annual conference once a year. Brief: The Criminal Law Solicitors' Association approached us to create a flexible method to disseminate information to their members. 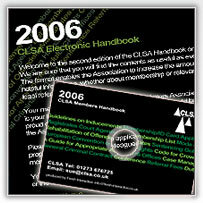 Bulky expensive manuals were printed, collated and posted to members every year. Approach: We created a CD ROM in business card format containing all their documents and manuals. We also wrote an installation package and menu which enabled members to update the information via the web with only two clicks. Result: The association uses the latest CD ROM technology and makes current information available at all times to the membership along with benefiting from a huge saving in printing costs. The CD also provides an excellent means of promoting next years conference and can use sound, video and photographs plus the ability to immediately go to the right place online to book. website with full content management, online joining and a massive library of professional papers for download or purchase.